How did I shave off over 100 calories and 8 grams of fat? Sorcery! In addition to substituting half of the potatoes with cauliflower, I was able to omit the butter altogether by using fat-free plain yogurt in its place. The first time I tried making these, I used a small amount of butter and the result was very dry and bland–the yogurt adds a little bit of moisture and a tangy, sour cream-like flavor. (Yes, I still hate yogurt! But I don’t hate it in things.) With the yogurt already adding some creaminess, I opted to add skim milk instead of heavy cream. And then I added cheddar cheese and chives for a boost of flavor. One thing I realized in making these, though, is that cauliflower just does not pipe well. I tried changing proportions, making the mixture wetter and then drier, and no matter what I did, I could not make these healthier duchess potatoes as pretty as the original. So maybe these aren’t holiday party worthy, but they are definitely a great side for a Sunday dinner–they’re not so nice to look at, but they taste really good. These duchess potatoes are lower in calories and fat than the traditional version. The secret? Replacing butter with yogurt, heavy cream with skim milk, and half the potatoes with cauliflower. They’re not as pretty, but they taste just as good! Preheat oven to 400 degrees. Spray a rimmed baking sheet with cooking spray or oil mister. Steam potatoes and cauliflower in a steamer basket over a few inches of boiling water for about 20 minutes, or until easily pierced with fork. Transfer to large bowl and mash thoroughly–if you’re piping these, it’s important to make sure the potato and cauliflower mixture is completely lump-free! It’s best to use a potato ricer if you have one. 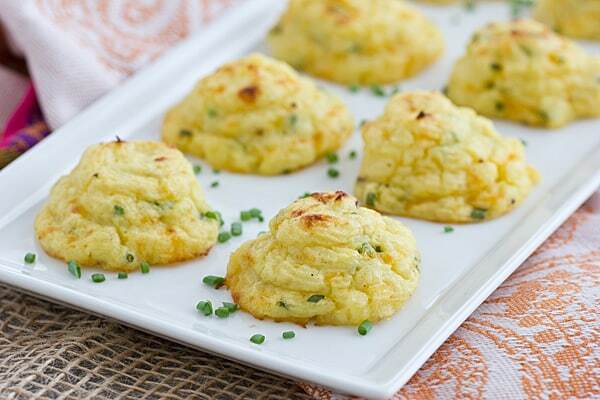 Add cheese, egg, milk, yogurt, salt and pepper to potatoes and cauliflower. Use a hand mixer on low speed to combine ingredients; fold in chives. Transfer mashed potato mixture to piping bag or a large plastic zip-top bag. Since the potatoes will lose their shape anyway, it’s best just to use a large round tip. If you’re using a plastic bag, cut off the corner and pipe the potatoes through that. I piped in a spiral, starting from the outer-edge and working my way towards the center moving clockwise, but again, since these end up flattening out a little, it doesn’t matter too much how you do it. Spray tops of potatoes with oil mister or cooking spray. Bake for 15 minutes, then turn on broiler and broil for about 5 minutes or until edges begin to brown. 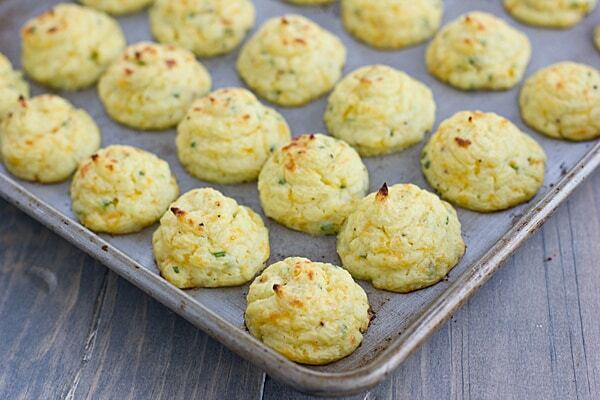 Oh I am going to have to make these, I love substituting cauliflower in recipes that ask for potato. They look really good! Wait, you hate yogurt? How is that possible? These looks so good, sure not ethereal but so yummy. And in the end, that is what matters. At least to me…. Yogurt is so nasty! It smells! Whoa – good job! I know it took a lot of work to get this recipe right but thanks for sharing it now that you have. It cracks me up how beautiful your ‘ugly’ potatoes turned out. If you want ugly blobs, I’ll give you ugly blobs. You, my dear, are not capable of making non-appetizing-looking dishes. Even if you could, your presentation always rocks – I’m so jealous! Well, they might look okay here, but if you lined mine up side-by-side with the real thing, they look pretty sad. 😉 But at least they are tasty! 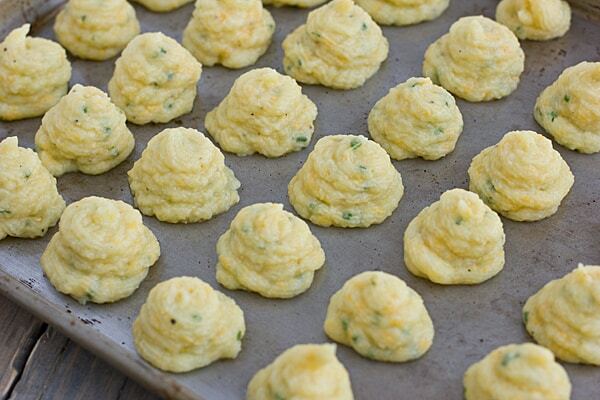 I’ve never made duchess potatoes so not sure what they should look like … but these still look yummy! I need to try this with my regular ol’ mashed potatoes too! Well, they look a lot fancier than mine. 🙂 But you could definitely do something like this with leftover mashed potatoes! oh these look fantastic!!! beautiful and delicious! Who cares what they look like (they look gorgeous), they sound delicious, and they’re half the fat and calories of the original version. Love it! These look so so so so delicious!!!! And quite fancy too! I was confused, thinking: Just how are these ugly? Oh, regular duchess potatoes are supposed to look better. I have no idea what duchess potatoes look like, but I think these look pretty damn good! I also wonder, if I want to skip piping, do you think scooping them works? Awesome. I like piping, but scooping is easier. I was fully prepared to add butter, but I tasted it and before adding it and realized that it didn’t need it. I think it’s the yogurt/cheese combo!